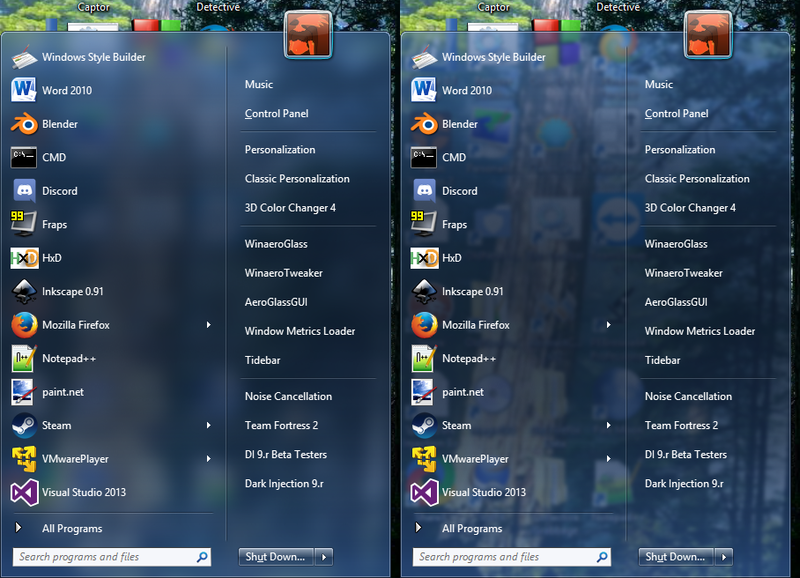 changed it to look closer to original Win 7 menu, on Win 7 operating system. It's close, but no vape cigar. transparency, colors, and MS secrets. Using skin on Windows 7 operating system. Could only get so far, where the color/brightness matches up with the taskbar. Toyed with brightness, opacity transparency, and color amount. I could not achieve a 100% match in all cases. Half of wallpaper MS themes work quite well. The other half doesn't have the right brightness/color ratio. then the menu is too bright on other themes. Using the "Override glass color" option in CSM, can help on a case by case basis, for matching. So as always, made the compromise to have everything halfway. So nothing will match exactly. No home runs, but will be in the ballpark. For myself, I have Override color option, turned off. with dither noise to hide most of the brightness steps. (low bit color makes horizontal step lines, similar to most so-called HD TVs, which are low bit as well). I brightened up the shutdown button. Even looked at the original button in Msstyles. It looks the same dark. I guess I know what premultiplied images are now. It compresses everything darker. Don't know the formula to reverse it, so I brightened rgb to the max, then brightened alpha channel appropriately. Added option for half user picture glare, or none. The original glare is too much. Skin appears to work ok in High DPI. Had a problem with the user picture showing up when it's not supposed to. I think it's fixed now. I separated the text from regular HIGH DPI. I did not copy every little detail from the original. It would take a month of Sundays to get everything perfect. It would get confusing too. Is this CSM, or real? Set menu to "High" option. Einstein formula going on the system? Using skin on Windows 10 operating system. I decided to add an option to make the skin more usable on Win 10. By decreasing the glass opacity, the strong dark Win 10 colors are reduced to resemble Win7 start menu. Win 10 uses totally different properties, so don't expect too much. You won't have the wide variety of colors to choose from. I was thinking of putting the Win 7 diagonal bars in the alpha channel of the menu bitmaps, for Win 10 use. The skin would have to be huge, so forget it. pick the "low" setting, pick "On Win 10", and set the "Taskbar opacity", (in CSM "Windows 10 Settings" tab) to 55. If you want more blur, you will have to go into the menu look tab. Change the "Glass opacity" to 25, and "Taskbar opacity" down to 30. The "med" option, with "On Win 10" is more like original CSM Aero skin. Set taskbar, and menu glass opacity back to regular values, for matching taskbar. Was going to make the menu borders have more white. Decided not to, as taskbar can't have it with matching lines. Thank you, Ivo, for letting us mod your Aero skin. EDIT: Just changed the picture, to show the highlight red squares for two different operating systems, for comparing. I probably made close to one hundred bitmaps with minor & major changes along the way, to get skin the way it looks. EDIT: Added combined skin "Full Glass WIN7LIKE" and "WIN7LIKE" to become "WIN7LIKE COMBO"
Now put in. One to match most common sizes. Last edited by juniper7 on Mon Feb 19, 2018 9:19 am, edited 6 times in total. Windows makes the taskbar have two types of brightness. Have CSM "Customize taskbar" set on "Glass"
and of course, check mark the " On Win 10" option. Ok. I have some problems. I extracted the Folder and put the Skin in the Skin folder. It shows up in the Skin tab in the Settings. My problem is,The skin will not work,I mess with the settings,restart my pc,etc.. Does the menu show color, or is it all white menu, flash and go away? Do other Win7 style skins work? Only start menu skins here. No themes. Themes alter the whole look of the system. To get exact look of Windows 7, with a theme on Win 10, might not even be possible. Microsoft has taken a lot of theme capability away, and the blur is not same type. Win7 has got to be the best looking system, Microsoft ever made. Their taskbar buttons with all the luscious animated lighting effects, so beautiful. Best way to enjoy Win7 is have the real thing. The best we can do here, is add an image for the task bar. Will still have the bland Win 10 square buttons on the taskbar, though. You can look in the taskbar forum section for various types of taskbar images for Win7 look. To make it easy, here are a couple from that section. I put them in a zip. Unzip and put the two images somewhere that won't get deleted easily, like picture folder. You need to set it up in the taskbar settings tab. For a closer look, use the wider image "Win7 Taskbar Reflection for opacity 40 qty .png"
and taskbar opacity to 40. If you are using Win 8, there is no blur available, I'm not sure what settings work. Thanks for your help and being nice. Works for Windows 10 operating system only, as it uses Metro color. I don't remember if Splitwirez made one of these mutations already? I know the classic Claude Glass skin is similar. Here is my 7 style full glass version. A bit boring though, when it's all the same color. The middle menu shadow helps a little, but makes it darker. Bit of a love/hate thing. That's why I added the Metro color to brighten up again. Was still not enough, so I put back all white submenus. Sorry. The file got kind of big. I had to add lots of dither noise to help cover up the horizontal steps from low bit color. It did not get rid of it all, as I have old Adobe Elements 6 software. It tamed it though. Skin will not work at all, on Windows 7 operating system. Metro color text disables it from running. Skin is not going to work properly on Win 8, as glass blur not available on that operating system. It will be very dark, due to lack of glass blur. The inside programs menu will not show correctly. The metro colors will not work correctly. If you want to try anyway, switch option to white submenus. If you have Big Muscle, it should work, but the metro colors will be start screen colors, not desktop colors. When I upgraded to Win 10 Creators Update, there were a couple of problems that showed up. The Win7 scroll bar does not work anymore. An optional taskbar image does not stretch over the whole taskbar area, only at ends. Hopefully, Ivo can figure out what Microsoft has altered, and find a remedy. Menu can still work though. enter DBA664 into the CSM "Override glass menu color setting", and "Taskbar color" boxes & click ok.
To have taskbar match have at 0 menu opacity, taskbar 70 opacity for wax paper look. I don't remember if Splitwirez made one of these mutations already? Huh? What do you mean by "these mutations"? There is nothing really new with skin, except for using the extra bitmap slices, that can be used at search area. Ivo mentioned about it some time back, that is used in his Metro skin. That's the way the blue line above the shutdown button (white submenu), stays same distance, if 144 DPI is picked. Is it the correct way to do it? Probably not, seems to work though. You know way back when you were experimenting with the aero skin, coming up with transmogrification variants. You know, like the cosmic, and solar radiation that rains down on us. Usually not enough to destroy quickly, just enough to damage the DNA, to allow to live on with portions that are different than before. Have I been watching too many mutant movies? Yes, yes I have. Come to think of it, I don't think Ivo had the option for 1st column to be glass at that time. to get Win 7 look, or the "Singing in the shower,di,di,dah,di,di,di,dah" foggy shower doors look on 8.1? so a png transparent background icon can be used instead. Can you add reflection (the diagonal shiny bars) to the start menu skin? Kind of late, but I'm working on it now. It will not look exactly like Win7 shiny bars, but close enough. Will probably finish this weekend, unless I die shoveling snow. See the picture of what it looks like so far today. I'm adding all those bigger size picture frames. Using the Full WIN7LIKE skin, modifying to have the standard split white option. It's really for Windows 10, because of use of "$Metro colors"
I'll put small -8 size font option if it helps people with newer HiDPI screens. Expect Greatness.....not in the features, but in size of the file. I put it in zip (big file)at top of post. It is the combination of " Full Glass WIN7LIKE" and "WIN7LIKE" skins. Was made for Windows 10, due to some options that use Metro colors. It still works on Windows 7 with CSM 4.3.0 as long as not set on Metro color options. I think CSM 4.3.1 killed it from running at all. Would have to click on "Menu Look" tab, and adjust menu color blending/glass intensity settings. I did not try on Win8. It should work better if Big Muscle aero glass blur installed. The Metro color options get adjusted using Start Screen color settings. Ok, back to writing my bla, bla novel. Yeah, the reflection image overlay didn't work out too well. The way I think Windows 7 does it, is take the diagonal bar image in Aero theme. Then it gets enlarged to match whatever size desktop is used. Then it is displayed as an alpha layer. So if start menu is at the bottom left, then the same corner of the reflection bars will show through. Have a look at the picture right side. For Classic Shell, Ivo states that the pattern image begins in the top left. The bars will show in wrong location, as well as possible different angle. So right away, it is never going to match exactly the correct corner. Add to that, the pattern image used does not stretch. then crop that so the top of menu starts at that exact same location when using as the pattern image. As you can figure, it's a lot of work, and only works for one size/dpi monitor. and the file size would be huge. Just one full-size reflection image is 2 MB! which is impossible with a stretching menu. I skipped that method. then copy/pasted to itself to be a bigger 1280x1200 so it won't tile repeat. It is not blurry enlarged. The medium size, I stole from Clasetro skin. I forgot how I made it originally. There was a lot of processing involved. For the large option, I enlarged original image 2 times, added extra corner bars. The angle of bars will not match original Win7 look, but hey, life is a compromise. This one is blurry enlarged. To be subtle, all three options use pattern masks that only let through around 20 to 30 percent brightness. Note. This might slow down menu animation on slow computers, like when opening jump view. it is image #190. Use Resource Hacker. See bottom of text file skin to see pattern masks used. Those masks let about 50 percent brightness. j'aime en effet beaucoup cet effet de relief. I really like this effect of relief. I don't want to stray too far away on this skin, as it's supposed to be a replica of Win7. I even have the original pin bitmaps for jump view on the white split option. I did not add black text / black text & shadow. merci juniper7, ce rajout .."only added the shadow for the white text on glass" est tout ce que je demandais ! thank you juniper7, this addition .."only added the shadow for the white text on glass" is all I asked !